This blog has been so so dormant lately….it has gone in the winter hibernation mode, i guess. 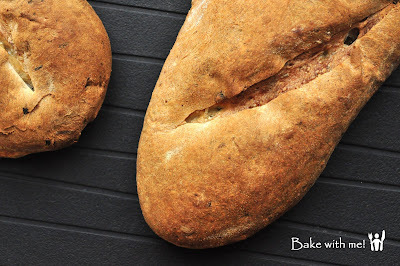 This doesn’t mean that the authors of this blog have stopped cooking & baking….on the contrary, we have been very busy in the kitchen and didn’t have time to update the blog. It takes an awful lot of effort to take the photos, edit them, upload them and link them into this blog post! There so many preparation behind the scene! (okok…enough excuses! =p). Now that the holiday season is behind us, I shall put in more effort in updating this blog. Maybe re-watching Julie & Julia will help me get into the cooking / baking mood. 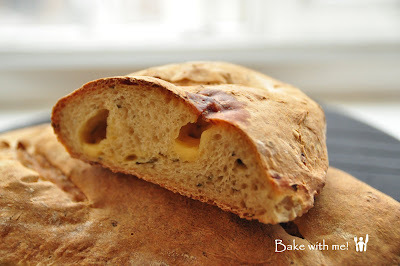 So here’s the first post in 2012, Potato, Cheddar, and Chive Torpedoes! It doesn’t sound like food at all, don’t look at me, I didn’t create the name. This is a recipe from “The Bread Baker’s Apprentice”, see page 278 for recipe. Confession: I didn’t bake this….little house elf chef did (yes, he has been doing so much cooking nowadays that it’s only fair to promote him and make him a co-author of this blog). Why the perculiar name? Well…Torpedoes denotes the shape of the bread….it’s shaped like a Torpedo, a shorter version of Baguette. 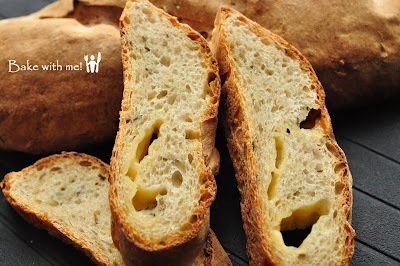 Filed under: BBA Challenge | Bread • Share on Facebook • Google+ it • Save to del.icio.us • Digg it!